Toffee was born in Cats Protection care in March 2012 to a pregnant stray. He was homed in May 2012 and sent his fosterer this lovely note to let her know how he was settling in his new home. Thought I would let you know how I am doing in my new home.I have been here for 2 weeks now and have settled in nicely. I have a lovely Mum and Dad and a big sister called Pip - she's a Jack Russell dog! The first night I was here she licked me all over and gave me a thorough wash. My fur was all wet! I was happy to let her clean me coz I enjoyed it. We play together and we do quite a bit of snoozing too I have sent you some photos of us. pictured are Toffee and new best friend, Pip! last. Last week Mummy & Daddy took me to the vets to get neutered – I didn’t know what that meant, but Mummy explained to me that would have less to clean when I have a wash – so that’s good! When I got home from the vets I only ate roast chicken breast for 2 days yum yum. Pip has been looking after me well this week – she even cleaned me when I was sick. I am better now so we have doing lots of playing. A new addition to the family in the form of Jenny, a pretty one eyed tortie girl, in November 2014 has proved a happy situation for all. 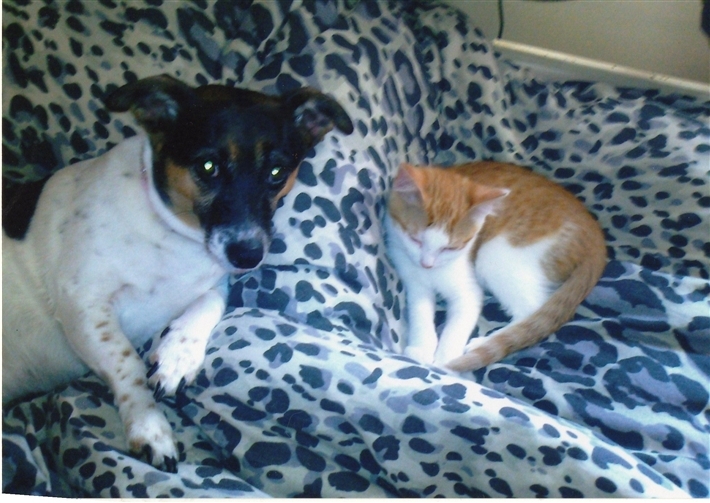 Jenny came into CP care as a stray but is much loved by Rebecca & Graham and feline family Toffee and Pip the dog! Here's what Jenny had to say in January 2015, "I have got a lovely new home and I have settled in nicely. I had a very nice Christmas, my first one. I enjoyed taking the baubles off the tree and pulling down all the tinsel! I get lots of cuddles and lots of lovely food. I know that I am wanted now and that I am loved by my Mummy and Daddy. At Christmas I ate lots of yummy turkey and I also had gammon, prawns and some smoked salmon, it was very yummy and I loved it. I also got some new toys that I love playing with. I love my big sister Pip and my big brother Toffee. I play chase with them if I feel like it. I also like cuddling with my Mummy on her lap and I do lots of purring. I've only got one eye, but Mummy says I'm adorable. I love my new home and want to stay here forever. Lots of love and purrs, Jenny"